The MK25 teamed with our exceptional new A700, offers a superior ultra-high airflow system for maximum performance in all temperatures and diving conditions. 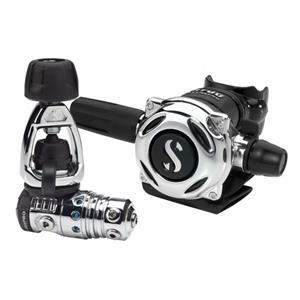 SCUBAPRO is synonymous with piston-controlled first stages. Our MK25 underscores this heritage with an array of patented features and an ultra-stable intermediate pressure for an extremely efficientl and consistent high delivery of air. Newly polished chrome edition, available uniquely with the A700 system, features 5 low pressure and 2 high pressure ports, plus a swiveling turret for convenient arrangement and personalisation of your gear.